The 2018 French Open final will be contested between the number one seed, Simona Halep and the number 10 seed, Sloane Stephens. I caught up with the Eurosport highlights on Thursday night after playing tennis (I didn’t injure myself or anyone else this time so wahey!) and now feel informed enough to write about the final. The pair will now have contested two of the last three Slam finals but who’s going to triumph on Saturday? Read on for some thoughts on the final. Spoiler alert – I don’t know who is going to win!!! Simona Halep was first into the final with a stunning 6-1 6-4 win over Garbiñe Muguruza. I think this was arguably Halep’s best performance of the season so far. It’s always difficult to judge when one player plays well and one doesn’t. Muguruza didn’t have that sharpness or intensity in her game early doors but did come back in what was a quality second set. In terms of the contest, I was disappointed this didn’t go three sets. Halep played a brilliant match. Her serve held up remarkably well, especially the second serve where she won 50% of points. The Romanian player was also very aggressive and managed to maintain that game plan when it counted. At 4-4 in the second set, Halep saved three break points in a seven deuce game. In all three break point saves, Halep didn’t hold back and went after her shots. I really thought Muguruza was going to win this match. Perhaps going in as a slight underdog was favourable for Halep and all the credit to her as she held her nerve when it counted. 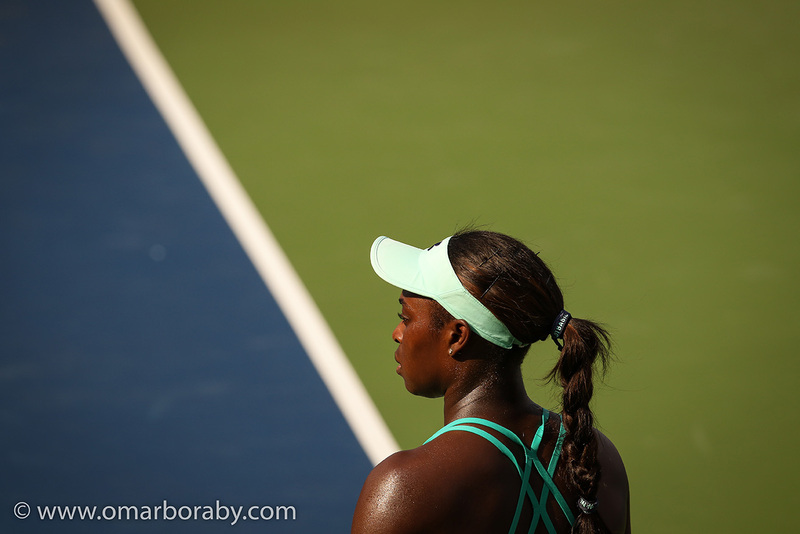 Sloane Stephens maintained her 100% record over Madison Keys with a 6-4 6-4 victory to reach her second Slam final. I was actually quite impressed with Keys in this match. Ultimately she made too many errors, but there were many positives to take away and she kept fighting to the end. Chris Evert made a good point in commentary about the occasions when Keys was in a defensive position, she would put up the high ball, rather than going for an audacious winner. This allowed her time to get back into a neutral position and continue the point. I thought it was a great tournament from Madison and she continues to improve on the clay. Stephens was supremely solid and hit just 11 unforced errors all match. She was unable to serve out the match at the first opportunity but did so confidently second time round, finishing on a superb point. Like Halep, her serve held up well and has been much, much better than pre-Roland Garros when it had looked like a weakness. The American’s movement has excelled on the clay. Stephens is oozing confident right now and once again, looking difficult to beat at the business end of a major tournament. Halep leads Stephens, 5-2 in their head-to-head and has won their last four matches all in straight sets. In fact they’ve never played a three set match against each other! I think it’s unfair to read too much in to their H2H – Stephens’s two wins came in 2013 when she was the higher ranked player, while Halep’s most recent wins came with Stephens’s making her first steps on the tour after a year out with a serious foot injury. I was very confident about my semi-final picks, which were only partially successful! For this final, i’m hugging the fence. I always like to see new players win Slams and personally, would love to see Simona do it as she has come so close in Slam finals before and endured some heartbreaking losses. Her ability to keep coming back and put herself in these positions of Slams again and again is admirable. This match-up, despite their recent encounters, does make me rather wary for Halep as Stephens, when on (which is NOW), has that feeling that she’s never going to miss. This has been the case since Stephens survived a nailbiter against Camila Giorgi in the third round where Giorgi twice served for the match. It’s also worth noting that Stephens has not lost a final at the tour level and played such a smart match in the US Open final last year. The American has the ability to crank up the pace when required and she’s pretty great at injecting it at the right time. If I had to pick a player that I would have more trust in holding it together mentally then it would definitely be Stephens. Halep has endured some disappointing losses at the ends of tournaments, most recently in Rome where it took her a set and a half to find her game, ultimately too late against Elina Svitolina. It looked like the same thing may happen in her quarter-final match against Angelique Kerber, yet she was super resilient to come back and win in three sets. Going in Halep’s favour, compared to Australia, is that she hasn’t destroyed herself to reach this stage. It would appear that she doesn’t seem to be carrying any significant injuries and she’s only played two three setters during the tournament. I also think that she doesn’t go in as the heavy favourite like last year, which is key. Stephens is a Slam champion and a top ten player who has consistently played the big tournaments well over the past year. The win over Muguruza was a huge victory for Halep, her first top five win since Roland Garros last year, which should give her bundles of belief. I want to go for Halep but I do still worry whether she can hold her nerve. She’s got the experience of previous finals and is speaking a good game in press but i’m still nervous for her! I think it’s a case of head says Stephens, heart says Halep. I won’t be able to watch the final live so look forward to catching up tomorrow evening, hopefully having not found out the result! Agree completely with your write up. Hopefully Halep can pull off the win. That sums it up perfectly, for me. Head says 50-50, heart says Halep’s time has finally come. Sad news —- Multiple Grand Slam Champion Maria Bueno has passed away at 78. I like Sloane, nothing against her but Simona it is for me. She can’t keep being the bridesmaid at these Slams, hopefully, the tennis gods smile upon Halep and let her be the bride for the day. The feel good story I would love to see today. lol..for once, I would love to see those poll vote @James..I reckon it will be 90% for Simona, always with the most die-hard fans! 😂😂😂 Yes I feel the same. Nothing against Sloane but want Simona to win. I concur with everything said. I was SHOCKED to see Muguruza out in straight sets when she’s looked practically unplayable all tournament long. Sloane Stephens is a very different player though. When she’s on, she’s so good at moving and retrieving and really forcing her opponents to come up with absolute magic in order to get past her. In these sort of scenarios, Halep has a tendency to go for too much. When things get tight, it’s almost like she doesn’t back her own game. On an unrelated note I played for the first time yesterday in ages. Got bageled in the first set, unable to find pace on my forehand. Then won the second set. Lost a close deciding set…forgot how exhausting playing can be, i could barely walk home!